We are pleased to announce that the Brzeszcze Commune has completed the project entitled "Raising the Energy Efficiency of Educational Centers in the Brzeszcze Commune", co-financed by the European Economic Area Financial Mechanism and the Norwegian Financial Mechanism 2009-2014. The project's goal was to reduce greenhouse gas emissions and air pollution and increase the share of renewable energy in the overall energy balance. The original agreement was concluded on July 15, 2015 between the Minister of the Environment, who acts as the PL04 Program Operator, on behalf of which the National Fund for Environmental Protection and Water Management in Warsaw operates and the Brzeszcze Municipality. installation of building energy management (BMS) - lighting control (motion sensors) and monitoring of electricity consumption and production by photovoltaic cells. Contractor: Construction Company "WLODARZ" Michal Wlodarz and "ECOMEX" Ltd.
installation of energy management system in the building (BMS) - lighting control (motion detectors) and monitoring of electricity consumption and production by photovoltaic cells. The total cost of the work performed under the original contract amounted to 3 283 000.00 PLN of which 2 407 824.66 PLN was the amount of co-financing. On 31 August 2016, an annex to the aforementioned annex was signed. The agreement covers the improvement of the energy efficiency of the kindergarten buildings located at ul. Kazimierza Wielkiego 38 (Kindergarden ZYRAFA) and ul. Narutowicza 6 (Kindergarden SUN) in Brzeszcze, as well as the buildings of Primary School No. 1 at ul. Szkolna 6 in Brzeszcze and Primary School No. 2 at ul. Mickiewicza 3 in Brzeszcze. modernization of central heating installations - replacement of 63 radiators with thermocouples and about 199 m of ducts. full integration of the building's energy management system (BMS) - zone adaptive lighting control in corridors and basements, management of building heating - room temperature control (increase the number of independently controlled zones), data acquisition from PV and heat pump systems, Synchronization with new extended BMS functions, data archiving from counters. Contractor: Repair and Construction Company DANPRO Daniel Buczyński, PUPH OTECH Ltd., and Power Equipment Repair Company "ECOMEX" Ltd. Contractor: Construction and Design Company "WLODARZ" Michal Wlodarzand Power Equipment Repair Company "ECOMEX" Ltd. The total cost of the aforementioned works within the scope of extension No 1 of the Project amounted to PLN 2 037 313.29 PLN, of which PLN 1 496 512.36 was co-financed. Replacement of lighting built into energy-saving LED (76 luminaires with light sources). replacement of lighting built into energy-saving LED (365 luminaires with light sources). replacement of lighting built into energy-saving LEDs (207 luminaires with light sources). replacement of lighting built into energy-saving LED (47 luminaires with light sources). replacing the built-in lighting with energy-saving LEDs (67 luminaires with light sources). 5 521 310.80 PLN, of which the amount of the grant is 4 066 331.79 PLN. The total cost of the Project was 10 841 624.09 PLN, of which 7 970 668.82 PLN was the amount of co-financing. Number of light sources mentioned: 2418 pcs. Capacity of installed equipment using renewable energy sources: 0.25434 MW. We would like to provide you with information in conjuction with the start of the project under the name "Increasing the energy efficiency of buildings elementary schools no. 1 and 2 in the Municipality Brzeszcze", co-financed by the Financial Mechanism of the European Economic Area for years 2009-2014. The agreement between the Ministry of the Environment, acting as the PL04 ​​Programme Operator, which operates on behalf of the National Fund for Environmental Protection and Water Management in Warsaw, and the Municipality Brzeszcze was concluded on 15.07.2015 r. in Warsaw. The total value of the project is 3 378 958.00 PLN, the value of funding is 73.65% of eligible costs, which represents the value 2 478 458.00 PLN. Through the European Economic Area (EEA), Iceland, Liechtenstein and Norway are partners for 28 EU Member States in the EU internal market. Grants EEA and Norwegian Financial Mechanism represent the contribution of Iceland, Liechtenstein and Norway to reduce economic and social disparities and to strengthen bilateral relations with the EU in the countries of Central and South Europe. In the period 2009-2014 the value of the funds of the EEA and Norwegian Funds amounts to 1.79 billion euros. Norway provides around 97% of total funding. The funds are available to non-governmental organizations, research institutions and universities, the public sector and the private sector in the 16 newly acceded EU Member States, it is for Bulgaria, Cyprus, Czech Republic, Estonia, Hungary, Latvia, Lithuania, Malta, Poland, Romania, Slovakia, Slovenia and Greece, Portugal and Spain. Within this framework possible is extensive cooperation with entities from donor countries, and projects can be implemented until 2016. Key areas of support include environmental protection and climate change, research and scholarships, civil society, health care and support for children, gender equality, justice and cultural heritage. The scope of the Operational Programme PL04 ​​- "Saving energy and promoting renewable energy sources", which was attended by our municipality, is focusing on promoting energy conservation through the implementation of thermo-modernization projects, exchanges of built-in lighting and the possibility of exchanging existing, often obsolete energy sources supplying buildings for termo-modernization, with modern sources, including using energy from renewable sources. It is thanks to the EEA Financial Mechanism 2009-2014 Municipality Brzeszcze can perform this draft. Thermal insulation of roofs and exterior walls to reduce their permeability. Replacing wooden doors with insulated doors with gaskets. Exchange of embedded fluorescent lighting with energy-efficient LED, in order to reduce electricity consumption. Replacing the washbasin taps with time based regulations taps. The use of photovoltaic system to generate electricity for school’s own purposes. 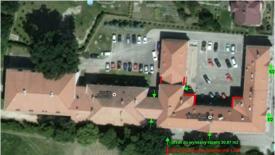 Exchange of embedded lighting with energy-efficient LED, in order to reduce electricity consumption. I.1., II.1. Insulation of the roof / flat-roof, walls and floors in order to reduce their permeability. For thermal insulation of outer walls will be used mineral wool with a thickness of 16 cm, ceilings will be insulated with polyurethane foam injection (the thickness of the foam depending on the site of warming is in the range of from 7 to 13 cm), whereas floors will be insulated with Styrodur. I.2. Replacement of existing wooden box windows in the gymnasium for PVC windows. b) 56 pcs. of other windows in the gymnasium with an area of 190.54 m2 - 3-pane windows, at least 5-chamber, heat transfer coefficient of not more than 0.930 W / m2K. I.3. Replacing the wooden doors for the doors energy efficient. There will be applied insulated steel doors, with glazing or partial glazing, resistant to impact and twisting. The following figure shows with the green arrows the locations of doors to exchanged. As part of the project for each school building will be installed on 160 photovoltaic panels with a total power of 40 kW - 80 kW together. min. 25 years: min. 80% of rated power. The produced energy will be allocated for their own purposes and will contribute to a substantial reduction in charges related to their functioning. I.5., II.8. Exchange of the built-in lightning with energy-saving lighting. Withing project's frames, in both school buildings, exchnaged will be th built on lightning with energy-efficient lighting LED. 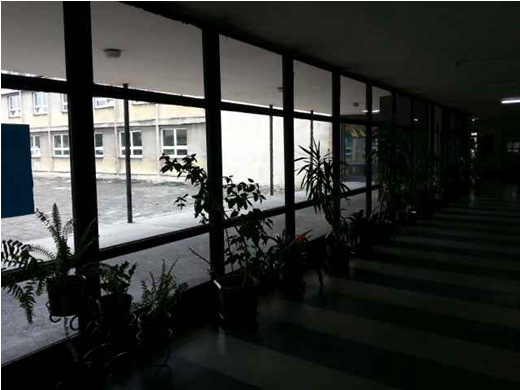 In total, in both schools, to replace is 1,212 light sources (lamps, light bulbs, halogens). 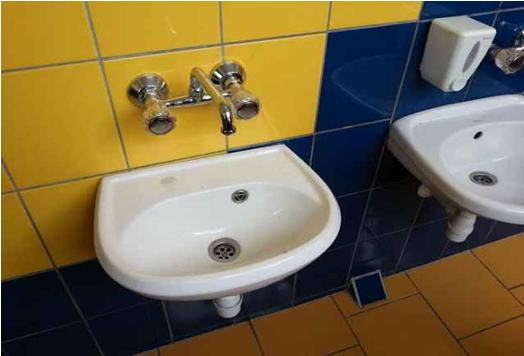 In addition, at each school will be installed 40 motion sensors in sensitive areas where their use is most reasonable (toilets, etc.). This will contribute to the reduction, nearly half, of the consumption of electricity for lighting both buildings. The total number of radiators to replace it: 40 pcs. Replacing the external wooden doors with steel doors, without glazing, resistant to shock and twisting, insulated with polyurethane foam and / or mineral wool. The scope of work involves cellular concrete bricked up in a corridor of the existing glass-wall (photo below), leaving a space with a height of 80 cm from the top. The wall will be insulated from the outside wool. 80-centimeter space will be filled with windows in steel frames. Dismantling of old and installation of new surface-mounted battery time with mixer in the knob. II.6. Liquidation of capacitive based electrical heaters, poorly insulated, and replace them with heat pump air-water. An air pump - water retrieves heat from the air. This device will provide heating domestic hot water, practically throughout the year. An important advantage of heat pumps is their environmental performance, because they do not produce any exhaust or waste, only electricity. The project will be implemented from August this year to April 2016. After its completion it will be executed audit, confirming the achievement of ecological effects contained in the application for funding the EEA. Without the funding from the Member - Donors execution of the project would not be possible. For what households consume energy and how much does it cost? According to statistical data, the most expensive item in the annual budget of the average household is space heating, which absorbs 46% of all energy costs. For electric households spends another 30% and the hot water consumption is 23% of annual costs. A separate, additional position in energy expenditure (and therefore transport) can be fuel for the car - its share is also significant, but very rarely is regarded by Poles surveyed as energy costs. Only 32% of Poles are aware of how the cost of heating affects the household budget expenditure1. The energy savings achieved through energy-efficient buildings is a modern approach to solving energy problems. Instead of increasing supply, you can fully meet the demand for warmth and comfort while consuming less energy. There is no need to burn more coal, gas, oil (emissions), reach for nuclear energy (safety) and renewable energy (costs). Just save wisely, or invest in energy-efficient homes. Research reveals not the best picture of the actual energy conservation in our country, and at the same time indicate a high potential for improvement. Solving the problem of access to energy is one of the most important challenges of the present. It requires a comprehensive approach and diverse activities. World energy consumption is growing rapidly while fossil fuel reserves decline rapidly. In 2005, we consumed five times more oil than discovered new deposits. This has a negative effect on the global economy, and we ourselves pay for it, quite literally, a high price. Currently in Poland primary source of energy is coal and lignite. According to data from the Central Statistical Office to meet the energy needs of households, it is a primary fuel (up to 73% of energy obtained from coal). Much lower in this sector consumption of natural gas (14%), alternative sources of energy, biomass, and the other (9%) and oil products (4%). In residential buildings, 28% of the total energy consumption is obtained directly from the combustion of coal. This proportion is significantly higher than the average in the whole economy (19%). With public opinion polls show that Poles are completely unaware of how much energy modern society, consume for household purposes. For heating buildings in which we live, work, spend our free time, the lighting, hot water heating, air conditioning, use of home appliances, etc., needed is more energy than the entire industry and transport. This stops surprising when we realize that over 80% of the time we spend in buildings that have become our basic environment to live. Only 4% of respondents correctly judged that heating has over 60% share in total energy consumption by households. In fact, it is an average of over 71%. Over 60% of respondents strongly understated heating share in total energy consumption by households, recognizing that it does not exceed 40 or even 20%. Almost 1/4 of Poles (23%) did not even try to assess how much of the energy is used for heating their apartment or house. The demand for space heating of residential buildings in Poland is of 90-120 kWh / m2 for new buildings to more than 240 kWh / m2 for buildings constructed before 1985. For comparison, the average for buildings in Denmark is 130 kWh / m2. Moreover, in currently built homes, the need is often only 25-55 kWh / m2. Energy consumption for heating usable 1m2 space flats in Poland determined on the basis of real fuel consumption is approximately 170 kWh / m2. The difference between the demand and consumption shows the Polish issue with skid, energy-intensive buildings whose residents can not afford to bear the high costs of heating. The effect of cold and moisture in the skid houses and apartments is worse state of human health and the accelerated decline in the market value of buildings. Unkeep hpuse or apartment has a significant position in household expenses, like the cost of heating schools, clinics and other public facilities, and a big burden on their budgets. Energy efficiency is a good way to reduce fixed costs while fully meeting the needs and improving the rooms standard. Poles, when asked about ways to save energy, pointed mainly to save electricity by switching off the light in rooms that are not used - 86%, and the exchange of light bulbs with nergy-saving light bulbs - 80% of the responses. Interestingly, as a good way to save energy replacement of windows and external doors indicated 83%, and the insulation of walls and / or roof of the building was mentioned by 3/4 Poles. It thus appears that the majority of respondents already have knowledge of how to save energy and thermomoderinization of buildings is considered to be very important. Unfortunately, few of this knowledge is used. Only 34% of Poles warms walls and roofs of their homes, even though it could bring major energy savings, many times greater than the saving of electricity. Improving the energy efficiency of the building begins with the reduction of heat loss escaping through the exterior building partitions: walls, roofs, windows and ventilation. Escape the heat can be easily stopped, by warming walls, roofs, basements, replacing windows on more insulation. Then you care of proper technical condition of equipment and installations for generating and distributing heat in the building should be taken. Comprehensive thermal insulation of buildings can reduce energy consumption by up to 70-90%, which in this way can save ten times more than by economical use of household appliances and electronics. About a few hundred PLN less for a year would spend every statistical Pole if had done thermomodernization in those buildings, for which it is economically justified. All together we would save annually about 20 billion PLN and so much could be spent on other expenses and investments (by: Technical economic aspects of building insulation, ITB, Warsaw 2006). Measures to improve energy efficiency of buildings bring not only economic benefits, but also ecological. The positive environmental results, include the slowdown exploitation of non-renewable energy sources, reduce air pollution and the avoidance of external costs caused by climate change. Heat and energy prices will rise, due to increasing fuel prices. This is confirmed trends that can be observed for many years. Prices of energy and its carriers increase on average by 4.5-8.0% per annum. Similar changes should be expected in the future, because since 1999, these growth trends are relatively stable. It is worth noting that the increase in prices of energy and its carriers is faster than the rate of inflation. 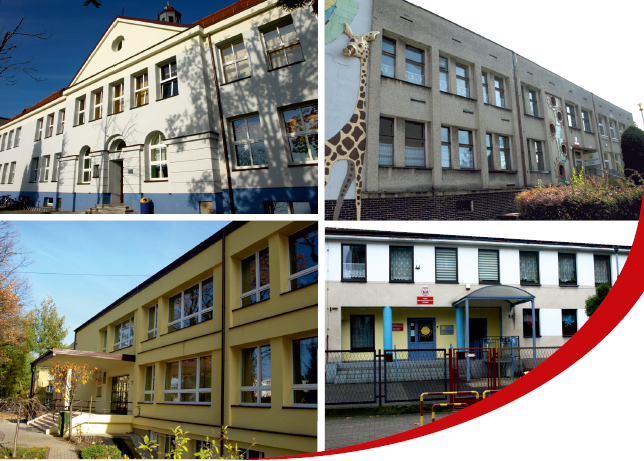 The municipality Brzeszcze is implementing the next stage of the project under the name "Improving the energy efficiency of educational institutions in the commune Brzeszcze" (formerly Project: "Increasing the energy efficiency of buildings of primary schools No. 1 and No. 2 and kindergarten No. 2 with integration classes "SUN" and No. 3 "GIRAFFE" in the Municipality of Brzeszcze), funded by the EEA Financial Mechanism and the Norwegian Financial Mechanism 2009 -2014. The aim of the project is to reduce greenhouse gas emissions and air pollution and to increase the share of energy from renewable sources in the overall energy consumption balance. The original agreement was concluded on 15th July 2015. Between the Minister of the Environment, acting as the Programme Operator PL04, on behalf of which operates the National Fund for Environmental Protection and Water Management in Warsaw, and the Municipality of Brzeszcze. On 31st August 2016, has been signed an annex to the above contract, the scope of which includes improving the energy efficiency of kindergartens' buildings at Road's Casimir the Great 38 (Kindergarten GIRAFFE) and ul. Narutowicza 6 in Brzeszcze (Kindergarten SUN), as well as the building of the Primary School No. 1 at ul. Szkolna 6 in Brzeszcze and Primary School No. 2 at ul. Mickiewicza 3 in Brzeszcze. replacement of built-in lighting to energy-efficient LED (76 luminaires with light sources). replacement of built-in lighting to energy-efficient LED (365 luminaires with light sources). replacement of built-in lighting to energy-efficient LED (207 luminaires with light sources). replacement of built-in lighting to energy - efficient LED (47 luminaires with light sources). replacement of built-in lighting to energy-efficient LED (67 luminaires with light sources). The total cost of the above. the work to be completed on 31st March 2017 in the context of enlargement 2nd implemented Project is 5 505 153.60 PLN, of which the grant amount is 4 054 432.35 PLN. Reducing operating costs of modernized buildings – 792 636.93 PLN/ year. What households consume energy and how much it costs? According to statistical data, the most expensive item in the annual budget of the average household is space heating, which consumes 46% of total energy expenditure. On the electricity household spend another 30% and the hot water consumption is 23% of annual expenditure. A separate, additional position in energy expenditure (and also transport) can be fuel for the car - its share is also significant, but very rarely is it treated by Poles surveyed as energy costs. Only 32% of Poles are aware of how the cost of heating affects the expenses of the household budget. Energy savings achieved through energy-efficient buildings is a modern approach to solving energy problems. Instead of increasing supply, you can fully meet the demand for warmth and comfort, using less energy. No need to burn more coal, gas, oil (emissions), reach for nuclear energy (safety) and renewable energy (costs). Just wisely to save, or invest in energy-efficient homes. Research reveals not the best picture of the actual energy conservation in our country, and at the same time indicate a high potential for improvement. Solving the problem of access to energy is one of the most important contemporary challenges. It requires a comprehensive approach and diverse activities. World energy consumption is growing rapidly, and that fossil fuel reserves decline rapidly. In 2005, we used five times more oil than we discovered her new deposits. This has a negative effect on the global economy, and we ourselves pay for it, literally, a high price. Currently in Poland, the primary source of energy is coal and lignite. According to the Central Statistical Office, to meet the energy needs of households, it is a primary fuel (up to 73% of the energy obtained from coal). Much smaller in this sector consumption of natural gas (14%), alternative sources of energy, biomass, and the other (9%) and oil products (4%). In residential buildings, up to 28% of the total consumed energy is obtained directly from the combustion of coal. This proportion is significantly higher than the average in the entire economy (19%). With public opinion polls show that Poles are completely unaware of how much energy a modern society, so we consume for the purpose of living. For heating buildings in which we live, work, spend our free time, the lighting, heating hot water, air conditioning, use of home appliances, etc., We need more energy than the entire industry and transport. It ceases to surprise when we realize that over 80% of the time we spend in buildings, which have become our basic living environment. Only 4% of respondents correctly estimated that heating is more than 60% share in total energy consumption by households. In fact, this is an average of over 71%. Over 60% of respondents strongly lowered involved heating in total energy consumption by households, recognizing that it does not exceed 40 or even 20%. Almost 1/4 of Poles (23%) did not even try to assess how much of the energy is consumed for heating their apartment or house. The demand for space heating of residential buildings in Poland is of 90-120 kWh / m2 for new buildings, more than 240 kWh / m2 for buildings constructed before 1985. For comparison, the average for buildings in Denmark is 130 kWh / m2. Moreover, there are currently built homes, the need is often only 25-55 kWh / m2. Energy consumption for heating 1m2 of usable area of flats in Poland, determined on the basis of real fuel consumption is about 170 kWh / m2. The difference between the demand and consumption shows the Polish issue skid, energy-intensive homes, whose residents can not afford to bear the high costs of heating. The effect of cold and moisture skid houses and apartments is worse state of human health and the accelerated decline in the market value of the buildings. Keeping your home or apartment has a significant position in home expenses, like the cost of heating schools, clinics and other public facilities, and is a heavy burden on their budgets. Energy efficiency is a good way to reduce fixed costs while fully meeting the needs and improving the standard of the rooms. Poles asked about ways of saving energy, pointed mainly to save energy by extinguishing the lights in rooms that are not used - 86%, and the exchange of light bulbs with energy-saving - 80% of answers. Interestingly, as a good way to save energy replacement of windows and exterior doors indicated 83%, and the insulation of walls and / or roof of the building was mentioned until 3/4 Poles. It thus appears that the majority of respondents already have knowledge of how you can save energy and thermo-modernization of buildings is considered to be very important. Unfortunately, few of this knowledge to use. Only 34% of Poles warms the walls and roofs of their homes, even though it may lead to large energy savings, many times greater than the saving of electricity. Improving the energy efficiency of the building begins with reducing the loss of heat escaping through the exterior building partitions: walls, roofs, windows and ventilation. Escape the heat, you can easily stop, warming the walls, roofs, basements, exchanging windows with more insulation. Then you should take care of proper technical condition of the equipment and installations for the production and distribution of heat in the building. Comprehensive thermal buildings can reduce energy consumption by up to 70-90%, which is the way you can save ten times more than a money-saving thanks to the use of household appliances and electronics. About a few hundred dollars less per year would spend every statistical Pole, if had been thermos modernized only those buildings for which it is economically justified. All together we would save annually about 20 billion dollars and so much could be spent on other expenses and investments (by: Technical economic aspects of building insulation, ITB, Warsaw 2006). Measures to improve energy efficiency of buildings thus bring not only economic benefits, but also ecological. The positive environmental results, include the slowdown exploitation of non-renewable energy sources, reduction of air pollution and the avoidance of external costs caused by climate change. Prices of heat and energy will increase, due to increased fuel prices. This is confirmed by the trends that can be observed for many years. Prices carriers and the same energy to grow by an average of 4.5-8.0% per year. Similar changes can be expected in the future, because since 1999, these growth trends are relatively stable. It is worth noting that the rise in prices of energy and its carriers is faster than the rate of inflation. On March 28 2017 the Brzeszcze Commune completed the next stage of the project (the so-called extension 1) titled "PROMOTING THE EFFICIENCY OF ENERGY ELEVATION PLANTS IN THE AREA OF BRZESZCZE" (former name of the project: "Raising the Energy Efficiency of Primary Schools No.1 and No.2, and Kindergartens with integrational branches: No.2 "Sloneczko" and No. 3 "Zyrafa" in Brzeszcze Commune), co-financed From the resources of the European Economic Area Financial Mechanism and the Norwegian Financial Mechanism 2009-2014. The aim of the project was to improve the energy efficiency of buildings of educational institutions through their thermal modernization and the use of renewable energy sources. The result of the project is the reduction of greenhouse gas emissions and air pollution and the increase of the share of renewable energy in the overall energy balance. As a result of an annex to the agreement with the National Fund for Environmental Protection and Water Management in Warsaw, the Brzeszcze Commune received subsidies for the implementation of the scope of work, which includes improving the energy efficiency of the Kindergarten buildings located at ul.Kazimierza Wielkiego 38 (Kindergarden Zyrafa) and at ul.Narutowicza 6 (Kindergarten Sloneczko) in Brzeszcze, as well as the buildings of Primary School No. 1 at ul. Szkolna 6 in Brzeszcze and Primary School No. 2 at ul. Mickiewicza 3 in Brzeszcze. modernization of the central heating system - replacing 62 radiators with thermocouples and about 187 m of cables. C) full integration of the building's energy management system (BMS) - zone adaptive lighting control in corridors and basements, management of building heating - room temperature control (increase the number of independently controlled zones), data acquisition from PV and heat pump systems, synchronization with new extended BMS functions, data archiving from counters. The total cost of the aforementioned works within the scope of extension No 1 of the Project implemented amounted to 2 037 313.29 PLN, of which 1 496 512.36 PLN was co-financed.